← Can A ‘Red Flag’ Gun Law Fly In A Red State? Civil rights attorneys say the Supreme Court’s decision Monday in a Texas redistricting case showed how difficult it is to prove discrimination in voting laws. The Supreme Court mostly sided with Republican lawmakers in the case, which challenged state House and congressional maps. Plaintiffs had argued lawmakers intentionally discriminated against minorities when they drew up the maps. 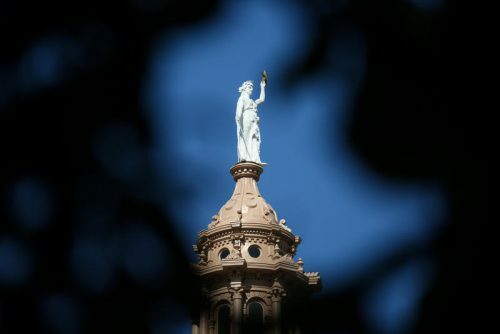 In an opinion written by Justice Samuel Alito, however, the court said “the 2013 Legislature lacked discriminatory intent.” The court directed lawmakers to redraw only one district – held by a Democrat in Fort Worth. “This is a huge ruling that has lots of implications, not only for Texas, but the whole of the nation,” said Michael Li, senior counsel for the Brennan Center for Justice’s Democracy Program. The decision came down exactly five years after the Supreme Court struck down a major provision of the Voting Rights Act of 1965. In that case, the court invalidated Section 5 – a part of the law that required states like Texas, which have a history of discriminating against minorities, to clear all their voting laws and procedures with the federal government. At the time, the court argued other parts of the law could take over and protect voters. “This shows that Chief Justice Roberts was entirely incorrect to say that other parts of the Voting Rights Act will make up for Section 5 being struck down,” said Mark Gaber, senior legal counsel for the Campaign Legal Center. Gaber was one of the lawyers who represented some of the plaintiffs in that 2013 Texas’ redistricting case. The thinking at the time was that Section 3 could make up for the loss of Section 5. But there are big differences between the two sections. Under Section 5, Texas had to prove the state wasn’t discriminating against minorities before it could enact a law. But under Section 3, lawmakers can enact a voting law or political map without preclearance from the government. If groups are concerned after a law is passed, it’s up to them to prove in court that the law is discriminatory. “And so it makes it incredibly burdensome for civil rights plaintiffs groups to show in court that the Legislature was discriminating,” Gaber said. Compounding that burden, he said, Texas lawmakers were allowed to withhold emails and documents because of legislative privilege during the 2013 case. It also took a long time for the case to work through the courts. “It just does not work to protect people’s voting rights if it takes eight years and you can’t gain access to evidence that the Supreme Court will decide is sufficient to prove your case,” Gaber said. In this case, Li said, there was a lot of evidence. In fact, a three-judge federal panel found overwhelming evidence that the state intended to discriminate against black and Latino voters when it drew maps. Renea Hicks, an attorney representing plaintiffs in the case, said it’s easy to see how political power was distributed in 2011 and 2013. In the 2010 census, he said, Texas gained four congressional seats because of population growth. “Nearly all of it was attributable to minority population growth, particularly Latino population growth,” he said. Hicks said the Texas Legislature then “rebuffed” that growth and drew maps that didn’t give minorities any extra representation in the congressional maps. “So, Texas got the seats due to minority population growth and gave no seats to the minority population,” Hicks said. Even though attorneys say there is overwhelming evidence lawmakers hurt black and Latino voters in the state, the bar groups need to clear is high. Civil rights attorneys say this decision is also concerning because lawmakers will begin a new round of redistricting in just a few short years. This entry was posted in KRTS News and tagged Redistricting, SCOTUS. Bookmark the permalink.